I always considered it very important to preserve the picture’s plane as single entity, as a given. The illusion of deep space destroys the natural two-dimensional feature of the image on the canvas. I have realized long ago this hidden, mysterious law of painting and always strove for wholeness of the original plane. This flatness of the image, newly re-open by the artists of the twentieth century, is definitely one of the most important phenomena in the painting of our time. Yuri Larin for the readers of the ”Russian Art & Paris”. Interview of the artist Yuri Larin for the “Russian Art & Paris” journal. RA&P: – Yuri Nikolaevich, the history of Russia in the twentieth century is tragic. What events of this history make you feel optimistic? Yuri Larin: – Optimism is generally characteristic of the Russian people, even though there has been a lot of grief. This includes my life. But I always got lucky with good people and friends. I am grateful to my relatives who raised me like their own son, until they themselves were arrested. I gratefully recall the Akhtubinsky orphanage; I am still friends with the son of the orphanage director Vladimir Klimov. In 1990’s, when the redistribution of property took place in Moscow, my workshop was taken from me and I was forced to vacate the premises within five days. Then the wonderful doctor Alexander Konovalov, who had operated on me twice, helped temporarily store my artworks in the basement of the Institute of Neurosurgery. Vladimir Lukin and Yury Karjakin helped me get a new workshop. Even in hard times, most people remain human – I always noticed this. RA&P: – The cultural history of the past century is complex and diverse. What events in the field of culture do you consider most significant? Yuri Larin: – If you consider the field of literature, there were wonderful poets: Mandelstam, Pasternak, Zabolotsky… In the field of Russian art I love Russian avant-garde of the first half of the 20th century: Tatlin, Malevich. I was greatly influenced by their younger contemporaries, the representatives of “Jack of Diamonds” – Kuprin, Konchalovsky, Falk and other followers of Cezanne. This is not an exact answer to your question, but for me, Cezanne remains as an unshakable, cornerstone figure in the visual arts. 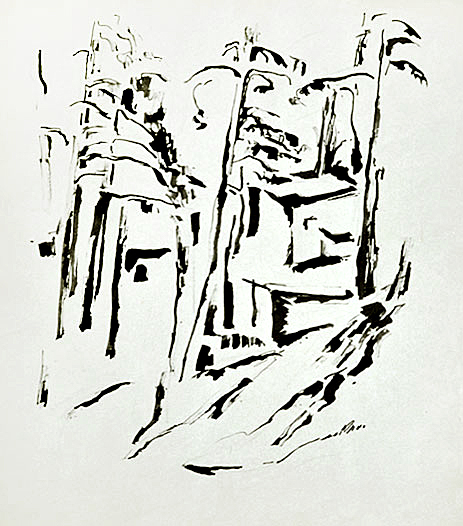 All Russian art of the early 20th century was influenced by Cezanne. The publishing house “21 Century” will soon release a book by Elena Murina on Paul Cezanne. This is the first great book about his work that is written in Russian. I like how the art developed in Russia after the revolution. When the revolutionary romanticism ended, a period of conservatism began. This was a huge loss in the sense of the formation of artistic idea and artistic image. Then visual art started to recover, but not in the direction which I expected. RA&P: – What do you think about the present state of art in Russia? called modern painting is a loss of meaning. For me the absence of formal visual objects does not mean the complete rejection of meaning. Meaning is not literary content. The meaning of painting – it is a spiritual beginning, which is always present in the work of art. Harmful commercialization, the pressure of popular culture on the artist leads to a downfall in artistic level, the loss of meaning. RA&P: – Many your artworks are on display today in the largest Russian museums.The road from first sketches to great museum collections has been both long and difficult. Is there a sense of satisfaction today? RA&P: – What was the most important thing that you have managed to achieve, or perhaps understand, as an artist? Yuri Larin: – Over my years of work, I have experienced a transformation of my artistic vision. At first, my ideal was the so-called landscapes of condition, and I was pleased when I was able to depict a rainy, foggy or evening environment. Since about 1974, I noticed that in watercolor paintings I had made, there appeared an increasing amount of deformations of space and generalizations of real objects in color masses; from this, the work of art would become more seamless and musical. Starting from 1976, I’m painting a little from natural life, and most of my watercolor and oil paintings are workshop’s works. These are the result of my observation of nature and the fixation in memory of the initial impulse, which is done with the help of a pencil drawing made on the spot. Good creative work must have two beginnings, i.e. should encompass both the visual and the musical side. Looking through my work, I realized that the good ones are those in which the struggle with the visual for the musical side reached its limit. The continuation of this struggle would have led to a complete loss of depiction, which means the loss of one of its two beginnings. I think that a work is completed upon reaching the limiting state of the transition from the visual beginning to the musical. RA&P: – What paintings do you think are the most important in your work? Towards which of your works would you like to draw the audience’s attention in the first place? 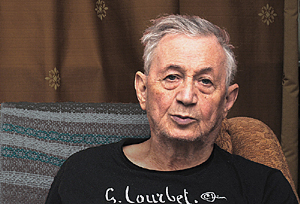 Yuri Larin: – I work in three techniques: drawing, watercolor, and oil. For years, I created a series of watercolors in various locations: Moscow, Northern Italy, Germany, the Baltic States, the Yaroslavl region. In each of this series there are at least a few canvases which I consider significant. 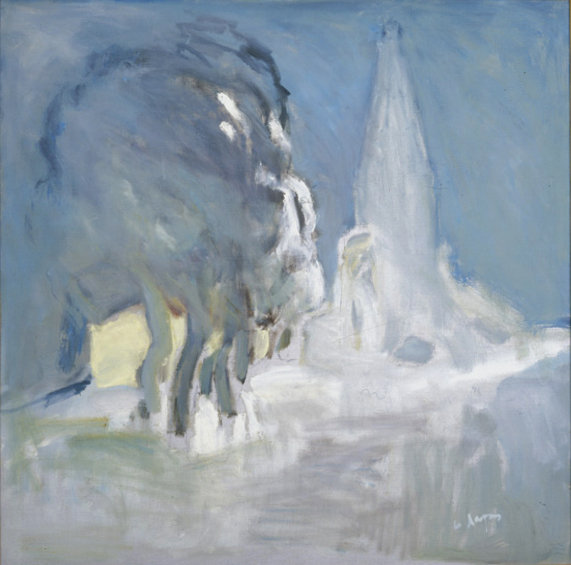 As for oil, the most important is considered to be “The white tree.” It is the most famous work, and is now located in the State Russian Museum. I would like to quote from an article “Authenticity of destiny” by Elena Murina: “… no wonder he so often says, always facing our modern politicized life – No, painting is better! as if reminding himself and others of the high calling of art to resist the worldly whirlpool and confusion of the senses. And in fact, looking at such a masterpiece, as “The white tree”, one can not but agree – Yes, painting is better! This canvas, where white, pink and blue, which are risky colors for painting, met and fused with each other, as it could only be in a sudden vision or beautiful dream, was created in a happy moment of creative completeness.” In fact, I think the most important artworks (landscapes, portraits, still life), are those in which I was able to bring my basic principle of the limiting condition. There are many, so it hardly makes sense to list them. 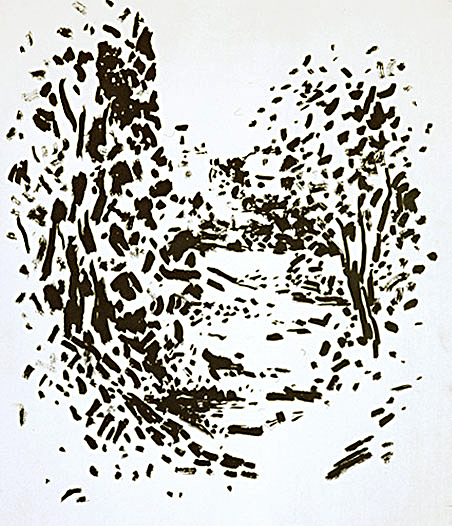 RA&P: – Have their been moments in your art life that you would regard as creative failures? Yuri Larin: – Creative failures …. I do not know. I always moved forward. If I had an unsuccessful work, I simply did not show it. RA&P: – Right now, next to you is your spouse – Olga Maksakova. The role of Olga in your work – is it the role of a Critic or a Muse? What does she think about this? Yuri Larin: – Although there are 5-6 portraits. Note: Olga Maksakova – PhD in Medical Science, psychotherapist, leading researcher of the Institute of Neurosurgery named after N. Burdenko. On August 26, 2012 from Moscow. • Painting entered the life of Yuri Larin, as a happy reward for the courage and sacrifice it took to become an artist. On his way to an early-recognized vocation, he faced many obstacles: orphanage in childhood, tragic fate of parents N. Bukharin and A. Larina, the need to keep “in the shadows” by selecting some mediocre profession. 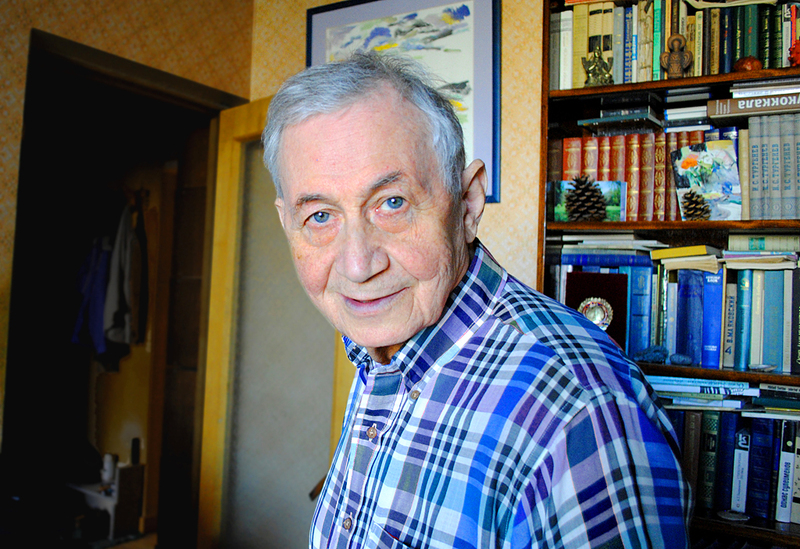 Only at the age of thirty, Yuri Larin risked starting over his life and applied to the Stroganov School, from which he graduated in 1970. Today behind him is a long path: tireless work in various media, participation in many exhibitions, teaching in the Art School “Memory of 1905”, and creative trips around the country and abroad. 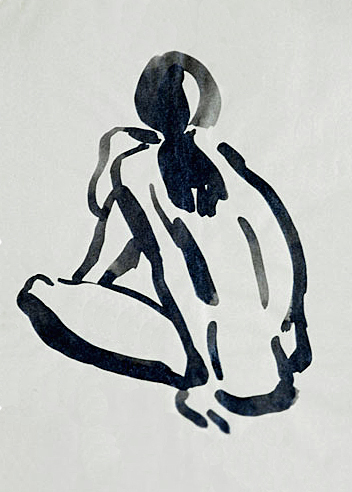 After his first solo exhibition in 1982, Yuri Larin gained the reputation of a serious artist among the few fans and followers of “pure” painting. • The social and aesthetic problems of the end of the 20th – beginning of the 21st century, more and more greatly replace painting on the periphery of artistic life. Therefore greater value is held by the standoff of its supporters to a disastrous process of rejection of art from the creative work culture created by the efforts of great artists of the twentieth century. Yuri Larin confirmed his belonging to the heirs of this culture, which was based on object-formative principles dating back to the work of Cezanne. Of course, he is is not a “Cezannist”, which would be an anachronism today. In general, its interaction with the riches of the classical pictorial heritage has no specific addresses. But when he recognizes “the conflict between the pictorial and musical – the eternal subject of painting” (the words of Yuri Larin), when he recognizes the art of painting as “the struggle of depiction with musicality”, his connection with the discoveries of Cezanne becomes apparent. Larin Yuri Nikolaevich, a painter and graphic artist, was born in 1936 in Moscow. He is the son of the prominent Soviet statesman Nikolai Bukharin and Anna Larina. After the execution of his father and the arrest of his mother, he was raised by relatives – Boris and Ida Guzman (1938-46). After the arrest of B. Guzman (1946), at the age of ten, Larin was brought up in an orphanage in Stalingrad (Volgograd). At the age of twenty, when Anna Larina returned from Stalin’s concentration camps, Yuri Larin first learned the name of his father – Nikolai Ivanovich Bukharin (1956). 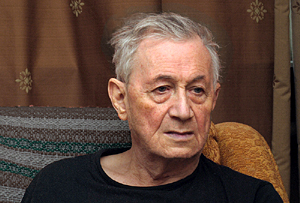 Yuri Larin graduated from the Novocherkassk Engineering Institute, worked as a water engineer on the construction of the Saratov Hydroelectric Station and in the Engineering design organizations (1958-60). Together with his mother, he received permission to return to Moscow (1960). In 1960 he began studying at the People’s University of Arts named after N. Krupskaya in drawing and painting department under the guidance of A. Trofimov. He graduated from the Moscow Higher School of Industrial Art (former Stroganovskoye), with teachers: Professor I. Lamtsov, Professor G. Lyudvig, Docent V. Pashkovsky (1970). 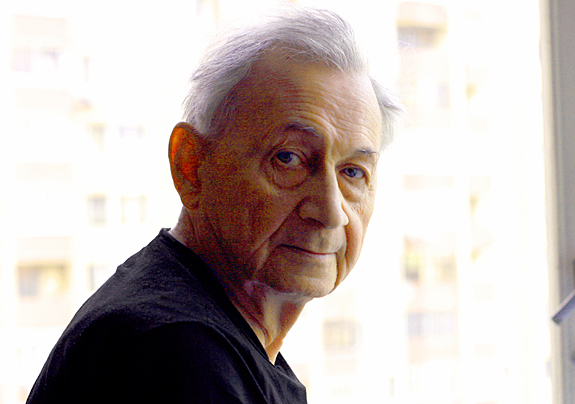 Yuri Larin taught at the Moscow State Academic Art College in Memory of 1905, (1970-1986). He has participated in art exhibitions since 1970. 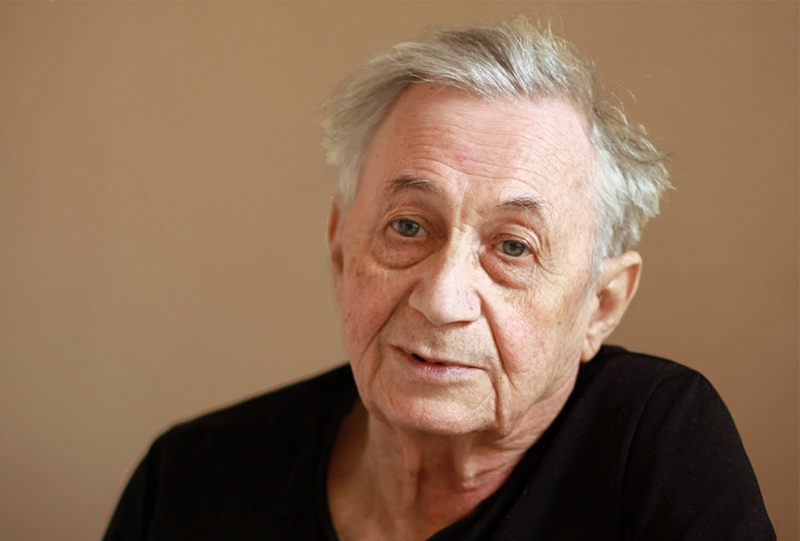 Yuri Larin is a member of the Union of Artists of the USSR (1977). The State Russian Museum (Saint Petersburg); The State Tretyakov Gallery (Moscow); The State Museum of Oriental Art (Moscow); Saratov State Art Museum named after A. Radischev; The State Historical and Architectural Museum “New Jerusalem” (Istra); Dilijan branch of the State Museum of Folk Art (Dilijan); Combined art museums and centers of aesthetic education of the Udmurt Republic (Izhevsk); The Volgograd Museum of Fine Arts; The Tomsk Regional Art Museum; East Kazakhstan Museum of Art; The Nizhny Tagil Museum of Fine Arts; The Moscow State Vadim Sidur’s Museum; Andrey Sakharov’s Museum (Moscow); The State Literary Museum (Moscow); The Collection of the Heinrich Böll Foundation (Berlin). Beautiful! Yuri and Olga bring sunlight and warmth to Foggy Albion. This is certainly a very informative interview and Larin is an absolutely wonderful artist. Thank you for obtaining knowledge about this painting and painter. I only regret that I have never heard of him before. Творчество ряда художников, чьи репродукции помещены в журнале, сложно поддаются общепринятым характеристикам, как и вообще все изобразительное искусство. Прежде всего хочется остановиться на картинах Ларина Ю. Н. Его живопись неоднозначна, но когда я смотрю эти работы я не могу забыть, кто их писал. Человек удивительной, трагической судьбы. Нам – хомосаветикус памятна вся эта трагедия: и дед – Ларин, яркий большевик и абсолютный инвалид, его красавица дочь-Анна Ларина, и отец Юрия Ларина – Николай Бухарин. Безусловно от него, Бухарина – одаренного художника-самоучки, Ю.Н. Ларин унаследовал дар писать картины с таким притчевым характером, с такой емкостью и светом. Поэтому и его жизнь, коротко рассказанная в интервью, так волнует читателя. Хочется отметить, что ряд художников представили превосходные работы, особенно когда современный рынок заполнен однодневками сомнительного качества. Прекрасны портреты Анастасии Вострецовой, необычна манера Гиви Сипрошвили. Безусловно привлекают внимание работы остальных художников. И особняком стоит живопись Алены Филипповой-Каргальской. Её старая Москва всегда в душах москвичей, где бы мы не жили. Поздравляю всех с выходом интересного арт-журнала, который безусловно будет способствовать продвижению русского искусства за рубежом. М. Казарновский, член Cоюза писателей России, лауреат Берлинской премии “Русская литература за рубежом”. У Вас очень интересные работы, хорошо чувствуете цвет и пространство, но главное что они живые и светлые. Спасибо Bам! Где-нибудь можно посмотреть Bаши другие работы? Только что узнал, что вчера умер художник Юрий Николаевич Ларин. Несколько раз в жизни я Юрия Николаевича видел. Первый раз, когда еще была жива его мама, которая совсем совсем молодой стала вдовой Бухарина и через 20 или 30 лет после его расстрела, записала на бумагу политическое завещание Бухарина, которое выучила наизусть перед тем, как Бухарина арестовали.. Мама попала в лагерь , а сын “естественно” попал в детдом. Не помню, вышли или нет уже к моменту как я ее увидел ее книга воспоминаний. Все казалось нереальным – не может же быть, что передо мной сидят и жена Бухарина и их с Бухариным сын. Только позже , уже на другой квартире я увидел и полистал изданный в Нью-Йорке толстый альбом с репродукциями работ художника Юрия Ларина (Бухарина). То, что увидел, сначала как-то не очень произвело впечатление – немного условные и очень приглушенные , бледные по тону пейзажи с размытыми “контурами” предметов. . Поэтично и неярко (это мое первое впечатление). Потом был у Юрия Ларина еще раз (наверное последний) , уже после смерти его мамы, чтобы попросить , кажется, что-то либо на выставку , а может быть и в подарок музею и центру имени Сахарова. Имя Бухарин все время стояло в голове – это сын Бухарина, а значит его живая частичка. И это невероятно. Но позже как-то почувствовал (или мне так показалось), что главное для этого человека – не чей он сын, а то, что он художник и пишет картины, что он живет ради этого.. К сожалению, ряд причин – сначала, полузапрет на имя, потом опухоль и операция на мозге, и после которой он продолжал писать картины, все-время явная ненастырность, ненавязчивый характер, непривычка говорить о себе, скромность – привели к тому, что в московской художественной жизни в наше время Юрий Николаевич Ларин участвовал негромко, и выставок у него было не так много как бы этого хотелось. Поэтому впечатление зрителей о Ларине как художнике – имею в виду не знатоков, еще не состоялось. Если это будет возможно нужна хорошая и большая выставка Юрия Николаевича Ларина в Москве. К сожалению, как нередко бывает – уже посмертная.